I am certainly not a math loving person – yet I do greatly enjoy using it so precisely in sewing. Even more so, I enjoy seeing how manipulating the basic shapes and parallelograms of geometry can create a garment that customizes to the human form. I know – I’m weirdly technical sometimes. Nevertheless, it’s true. Some form of math can find its parallel in fashion, in art, in nature even. 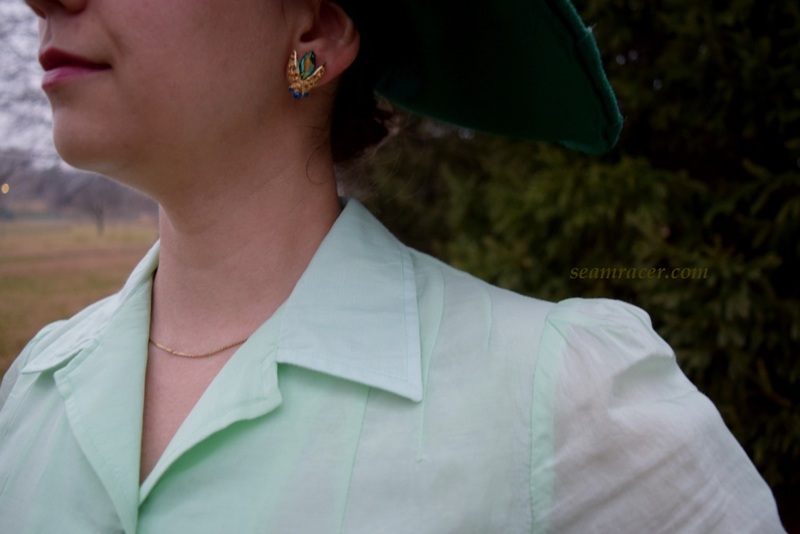 There are lots of angles, geometric shapes, and fashion parallels in these photos of my new, but vintage, multi-season blouse. How about a seek-and-find of some sort? I really tried something different with some of the styling and accessories here. I am completely loving it and it seems many passer-bys that day did too from the amount of compliment received! 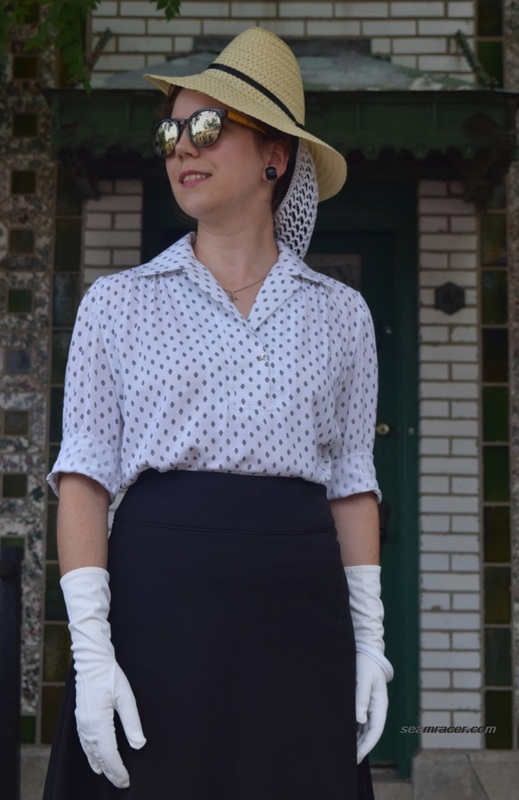 This blouse is from 1941, still technically pre-WWII for an American like myself, when many of the styles of the era still had strong fashion influences from the previous 1930s. The analogous black, white, grey, and cream colors in my outfit make this for a very undecidedly fall or summer set. Since I am all about finding a confusing balance, apparently, I just went with it by adding a 30’s Tyrolean hat (a re-fashion by me, post here) with a snood in my hair, my Grandmother’s WWII star pin to keep my collar closed, her vintage long gloves and earrings, with reproduction skirt and shoes (B.A.I.T. Halina pump). The amazing Tanith Rowan and her bringing back “Snoodtember” for 2017 was a big impetus to my even trying the combo of both snood and hat to match this outfit. 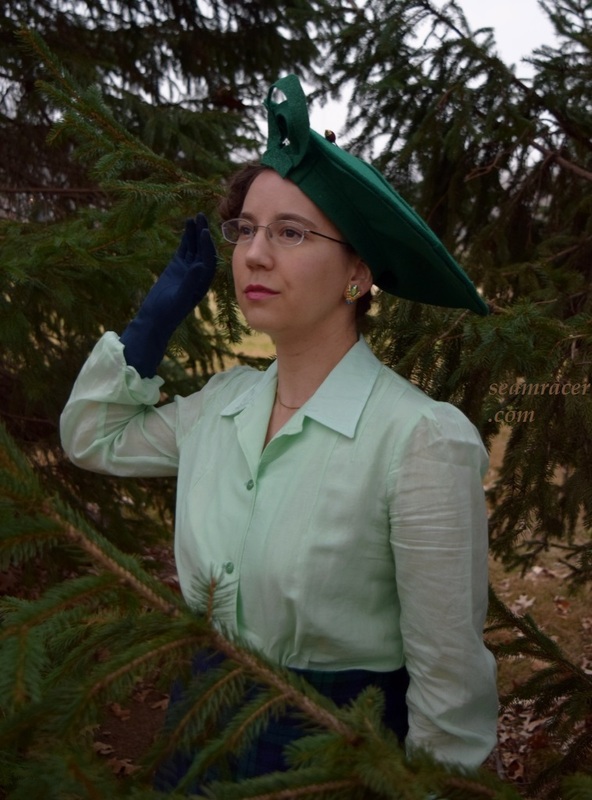 Her post for “Snoodtember” of last year (as seen here) and the amount of images from circa 1940 gave me a reason to break out my little used snoods and one of my favorite me-made hats to help date my new blouse a bit better by adding some vintage character that is not seen enough, in my opinion! The transition periods between decades are generally so very interesting to me, anyway. Most of the times they leave a lot of room for personal interpretation (while still being historical, if that is your thing, as it is for me many times). A little bit from the decade ahead, a bit from the decade past, and there you have an outfit from a perfect tossed up mix of two sets of 10 years. 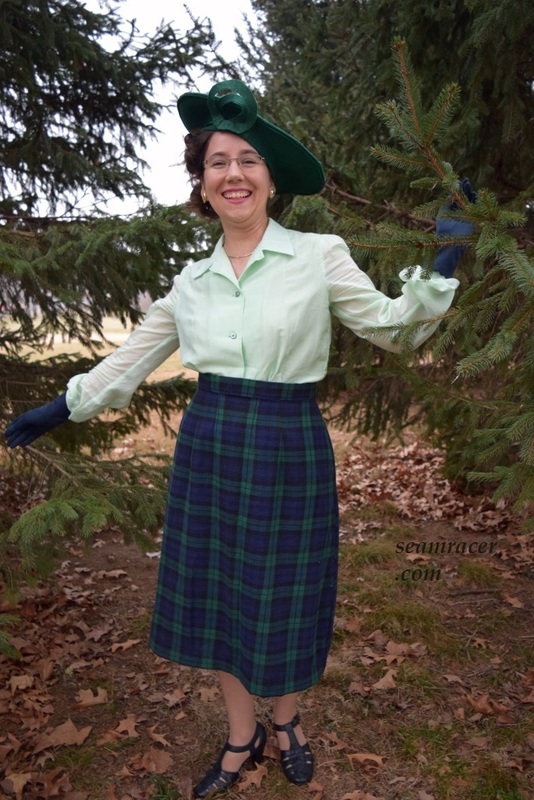 I am happy to have found a new way to enjoy and interpret the early 40’s, which I sew a lot from, with the combo of hat and snood. This won’t be the only time either! NOTIONS: Nothing but thread and scraps of interfacing were needed here, and I had all of that on hand. A vintage metal zipper from my stash on hand went in the side for the closing. TIME TO COMPLETE: This was a relatively easy and quick blouse – it was made in about 4 hours and finished on June 16, 2017. THE INSIDES: All lovely French seams with a bias covered hem. TOTAL COST: This was something I recently bought from Jo Ann’s in the last few months. Actually, to tell you full the truth, this is something my 5 year old son picked out. Yes, he enjoys going to the fabric store and many times if he’s not socializing with employees, he likes to pick out fabric, mostly for me, and sometimes for himself. This rayon was something I let his taste be the judge of…and I think he did a pretty good job here! I guess what I do is rubbing off on him! Anyway, I bought 3 yards of this fabric, intending on making this into a dress before I thought the fabric would do better as a blouse. I spend maybe $15 in total, but used half (1 ½ yards) so I could give the other half to my best sewing friend. I can’t wait for us to have matching blouses together! 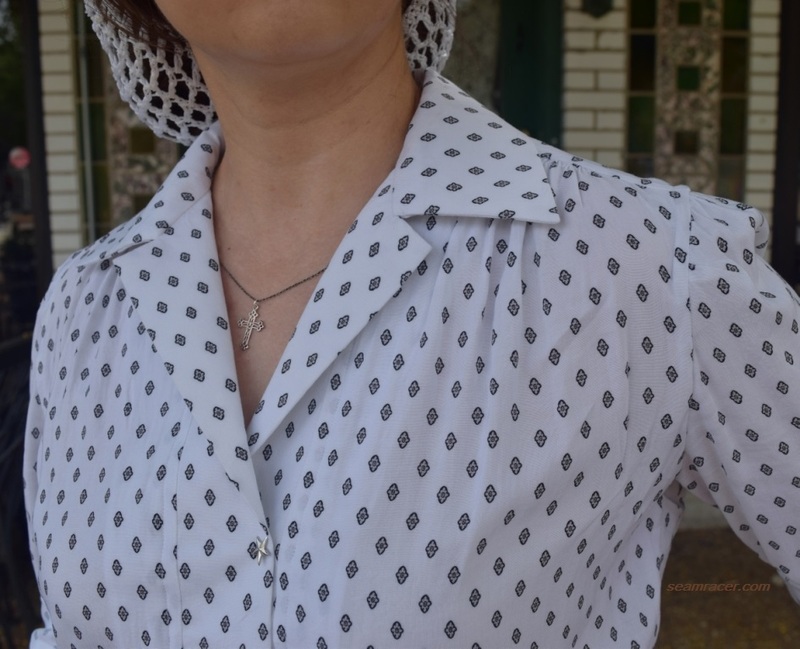 This is a great cheater’s pattern to have a top which looks like a traditional pointed collar blouse without being one. No buttons needed! Unfortunately the fabric pattern kind of hides the lovely placket detail so as to see everything of what’s going on. There is a wide, squared off collar placket which gently angles up to the upper shoulders. Depending on how deep of a chest exposure wanted, the placket can be left as it is for a deep V, but I prefer it pinned closed halfway up, the way you see it in my pictures. Either way it’s pop on, zip up the side ready to go! The smartest point about the placket is actually on the inside which no one sees. The edges to the facing half of the placket are slightly wider to easily cover the raw edges. Vintage patterns constantly surprise and impress me with their ingenuity in regards to the little things. It’s the little things, though that sometimes make all the difference. The small detail to the placket facing saved me time from hand stitching the placket down. 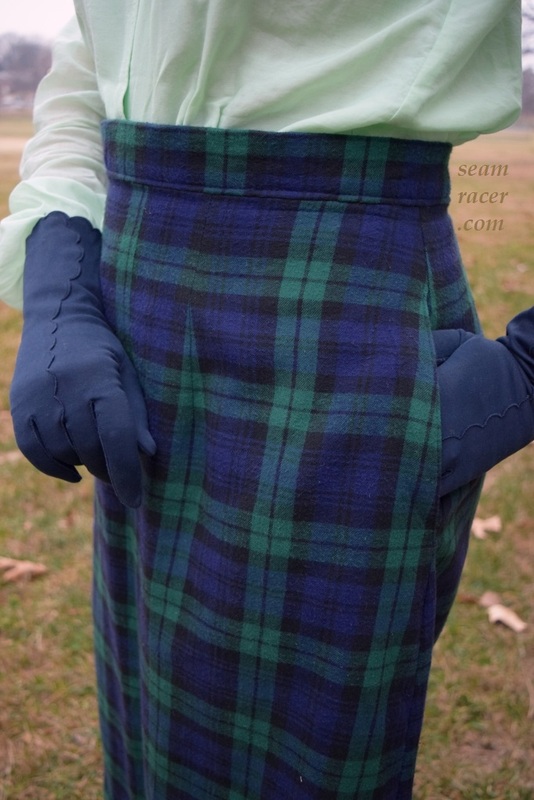 I could merely invisibly stitch “in the ditch” around the placket and easily catch the edge underneath, too. I even left off my customary top stitching on the outermost edges of this collar, a rarity for me to do on a blouse, but the stiffer interfacing and a good ironing give a very polished look to the collar with no visible stitching to ‘mar’ the smoothness. 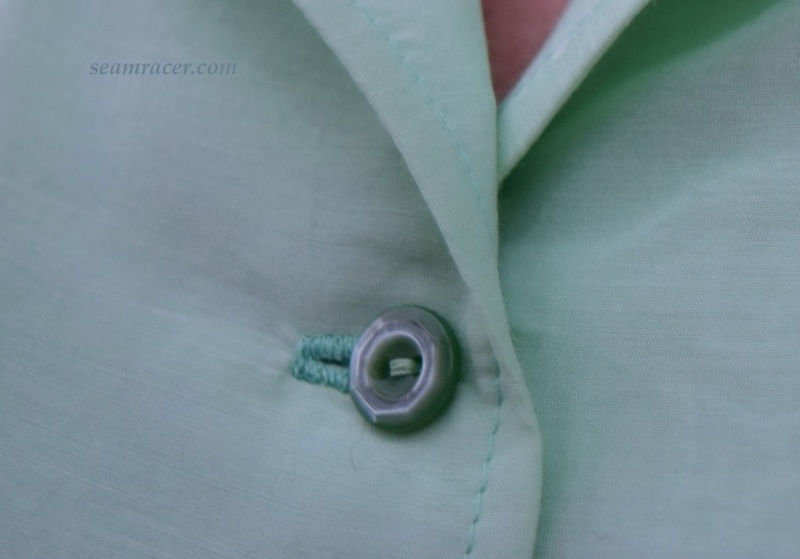 This placket-collar style must have been popular – and I perfectly understand why after making one myself! 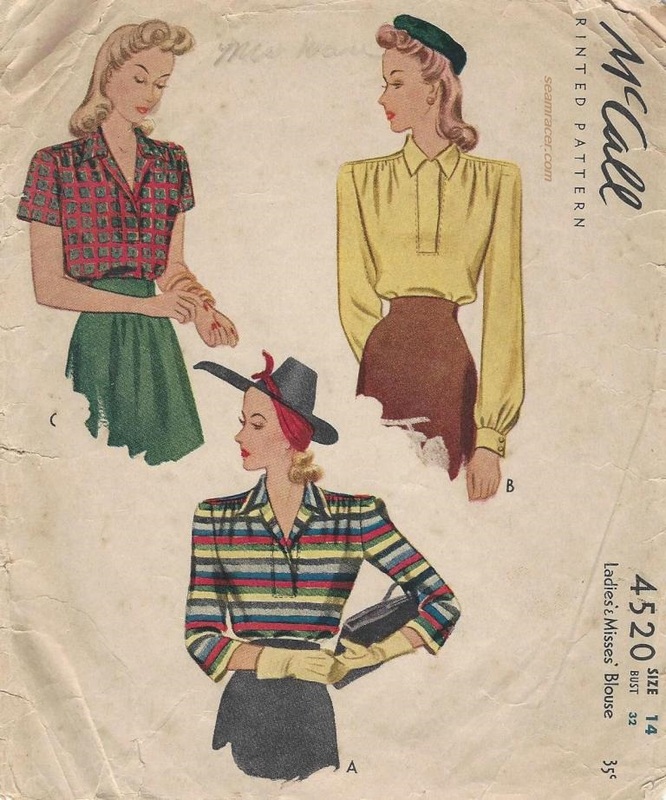 I’ve seen each of the major, as well as some of the minor, pattern companies have a version of this neckline throughout the early to mid-1940s. (See McCall #4130, year 1941; Du Barry #5785, year 1944; Simplicity #3900, year 1941; Hollywood #903, year 1942; and a re-printed De Pew #3504, year 1939 French pattern) I realized after seeing a few of the other pattern covers that apparently this neckline style also seems to fit nicely under jumpers, vests, and sweaters without the “distraction” of buttons– part of the reason, no doubt, that it was popular apart from the ease of dressing and making. 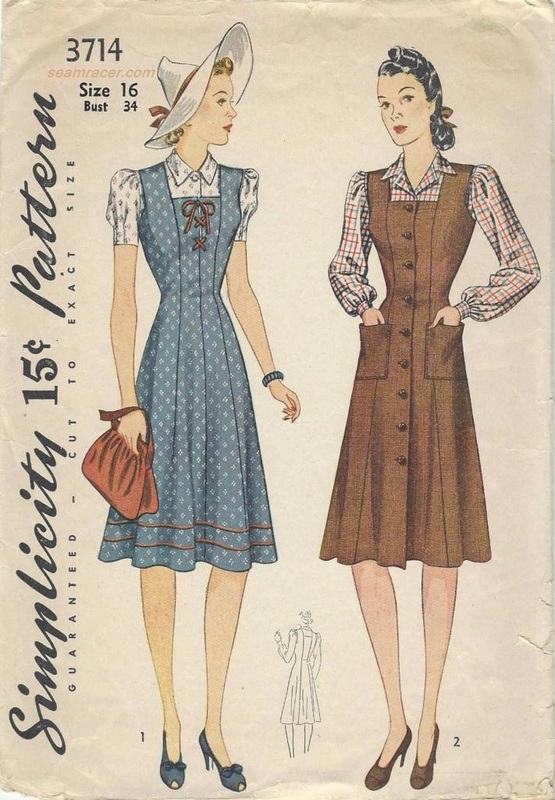 I am really tempted to try the lovely striped version on the cover of my pattern but the perfect matching along the collar placket and bodice would probably blow my brains to pull off…still, I’d like to try at some point. This is a very generously wide, loose, and sort of baggy blouse when it comes to the width across. One can see this a bit more obviously from the back or when my arms are up. However, this does make for a very comfy blouse. 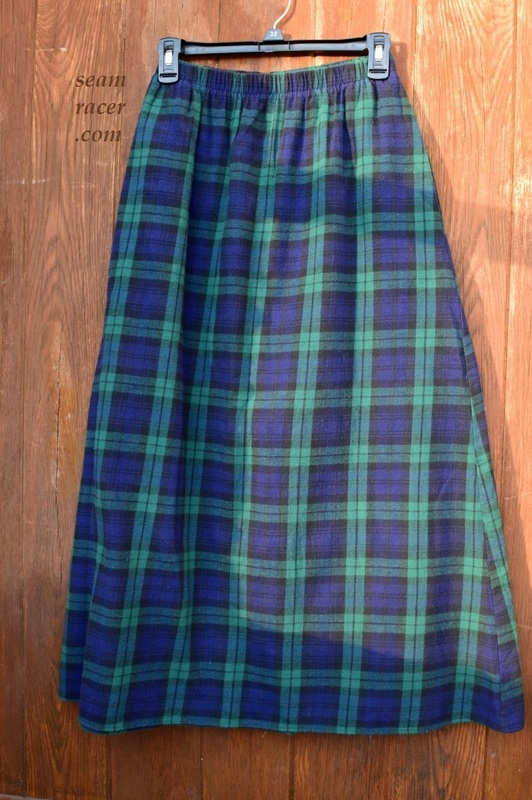 The rayon is so flowing that however generous, it looks good. A blousey 1940’s top needs to have something slimming or at least waist defining worn on the bottom half I’ve figured out. My modern, vintage-style, A-line black skirt matches well, but my Burda Style black pants match well, too, as well as some neutral and grey bottoms. Yay for a new staple separate! A pattern which fits as-is straight off of the tissue is the best find ever! I did lengthen the bottom hem just to make sure my blouse stays tucked in, but other than that I made no changes because this pattern was in my perfect size. I suppose I could have added stiffening to the sleeve caps so the trio of darts (VERY early 40’s trademark, by the way) would not look so droopy, but I didn’t…I might add that later. 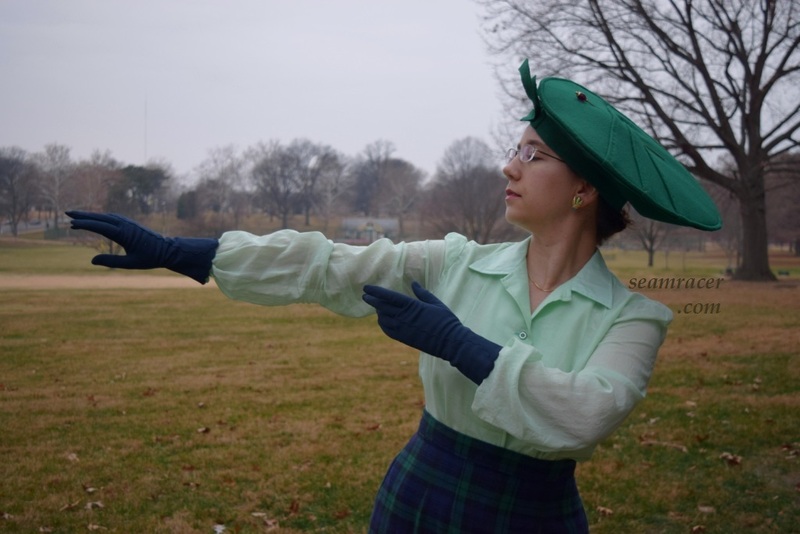 I also made the ¾ sleeves because I figured this will make this blouse more versatile. After all, when it’s warm out, I frequently find myself rolling up the sleeves to short sleeves anyway. Did you find some of the other geometric shapes on and around me? My fabric is a grid of floral diamonds. The 1910 to 1920 era building behind me is rich in square, rectangle, and octagon shaped brinks in a lovely glazed coating. Fancy brick work is what my hometown historically did best out of the whole country, and that’s a fact – not just a brag! I could name off a few more mathematical co-ordinations around me, but I’ll leave them up to those who want to find them. For some vague reason this outfit reminds me of something that has a very European vacation flair. Tell me if I’m crazy. Maybe in my mind that’s just where or what I’d like to be doing at this moment instead. 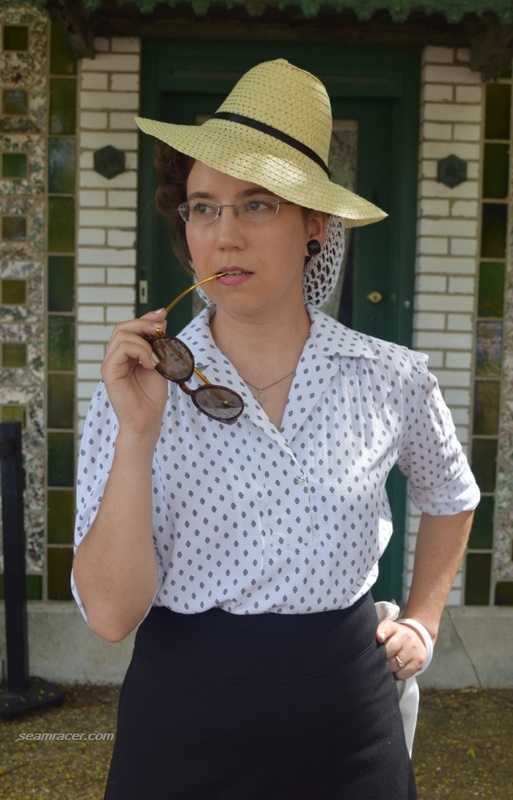 Maybe just a great outfit in the right location in my own town is taking me back in time mentally a bit…to a past period in history where I wouldn’t be the only one dressed like this! Oh well.